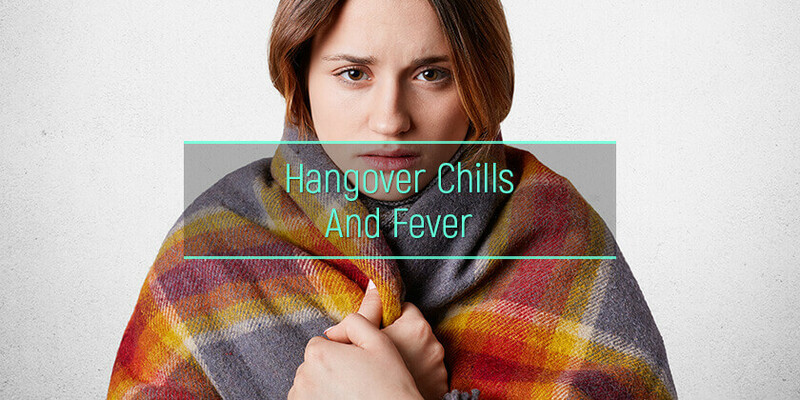 Hangovers fever and chills after drinking alcohol can have both physiological and behavioral effects. Alcohol makes one’s body warm inside but expands blood vessels thus causing rapid heat loss and diminishing the natural shivering response of the body system. The result of this is hangover chills which are often followed by fever. Alcohol intoxicated individuals can experience hypothermia and other symptoms of severe hangovers when exposed to low ambient temperature. The body system has a thermoneutral zone where temperatures are within the minimum and maximum allowable range. Any deviation from these limits causes hangover fever and chills. What are the hangover chills? What are the hangover fevers? Why does hangover cause chills and fevers? How does hangover affect body temperature regulation? How to cope with hangover chills and fevers? What are the signs one needs to see a doctor? Alcohol withdrawal chills result from imbalances in the nerve cell activity following the alteration of neurotransmitters such as gamma-aminobutyric acid and glutamate. In case one is wondering just how long a hangover can last, it largely depends on the person’s biological reactions to alcohol’s active compounds and the level of intoxication. That said, hangover chills and fever can last for a few minutes or as long as an hour. Can alcohol morning effects cause fever? The simple answer is yes it can. There are several mechanisms on how this happens. Dehydration and electrolyte loss due to sweating, vomiting, and diarrhea that causes lightheadedness. Low blood sugar caused by lactic acid accumulation in the liver during alcohol metabolism. Alcohol-induced hypoglycemia can cause general body weakness and fever from a hangover. Vasodilation after consumption of alcohol causes strains on the blood vessels. This, in turn, causes headaches. The effect of alcohol on hormones and neurotransmitters such as serotonin, prostaglandin, and histamine accelerates the pathogenesis of headaches. Effects of alcohol metabolites: acetaldehyde and acetate, generated in the two-step alcohol metabolism process. Accumulation of the metabolites causes headache, sweating, and flushes. Other active compounds present in alcohol also known as congeners can have an intoxicating effect that lingers on way after the blood alcohol content drops to zero. One of such congener is methanol. The effect of congeners on serotonin and histamine is associated with a headache after drinking alcohol. Can a hangover cause a fever? This has been the subject of research for a long time. Lots of findings have been presented, and logical explanations with causal relationships presented. Generally, hangover chills and alcohol fever can be the result of the direct effects of alcohol consumption, alcohol withdrawal, alcohol metabolism or even other substances present in alcohol. During hangovers, the sweating and vomiting cause fluid loss leading to dehydration and electrolytes imbalance in the body. This explains the frequent instances of fever after drinking that individuals experience. Long after bouts of drinking and when liver metabolism of alcohol is in top gear, lactic acid, an intermediate product of metabolism, builds up in the body fluids. This inhibits glucose production resulting in alcohol-induced hypoglycemia. The low sugar levels in the blood have been associated with among other things fatigue, mood disturbance, and the hangover fever. Exposure to alcohol causes changes in receptors within the nervous system, two of which are gamma-aminobutyric acid (GABA) and glutamate. During alcohol withdrawal, the central nervous system and the sympathetic nervous system do not recover as fast thus leaving the body in an imbalanced overdrive state. This causes extreme shaking and chills as well as sweating. Accumulation of acetaldehyde, an alcohol metabolite, can cause headaches. Acetaldehyde is a reactive chemical compound that has biological potencies. At high concentrations, hours or days after drinking episodes, individuals may begin sweating, nauseating and skin flushing. The liver works overtime to metabolize alcohol and return its levels to zero. This causes massive dissipation of heat in and around the liver while the other body organs remain cold. These temperature imbalances can cause chills that are followed by fever. Other active compounds in alcohol known as congeners have been found to lengthen hangover effects even when blood alcohol levels drop to zero. Methanol which thrives in the absence of ethanol is one of the congeners commonly found in drinks. These biologically active compounds increase levels of histamine and serotonin which then result in fevers. Gastrointestinal disturbances due to inflammation of the stomach lining can cause chest pain when drinking alcohol but also a series of hangover symptoms such as vomiting, nausea, lightheadedness, and abdominal pain. Vasodilation long after alcohol intake causes blood to flow closer to the surface of the skin the morning after. This also means that body heat moves away from the core and onto the body surface. During the hangover, evaporation takes place leaving the body with hangover chills. Alcohol affects multiple organs in the body including the brain. This alters physiological functions whose effects last long after the blood alcohol levels drop to zero. The hypothalamus, the section of the brain responsible for autonomic nervous control, gets stimulated thus interfering with processes such as hunger, homeostatic systems, and body temperature regulation. It is for this reason that individuals experience hangover sweat and hangover hot flashes in the days following heavy drinking. Alcohol is poikilothermic; this means that it impairs the adaptive system of the body to cold and sweat. While it is expected that once the alcohol levels in the blood drop to zero the impairment will fairly adjust back to normal, at times, this does not happen. Therefore during the hangover, the effects of minimized thermogenesis cause individuals to experience severe chills and shaking. Prolonged effects of hangover skin heat loss through cutaneous and subcutaneous vasodilation triggered by exposure to alcohol can give a false impression of comfort even in cold environments. This can cause shivering and chills. The combined effect of increased heat loss and decreased thermogenesis establishes a low setpoint for thermoregulation. This means the body doesn’t go beyond the lower level thus making one feel chills the morning after. After a heavy night of drinking, the last thing one would want is hangover chills, fevers, and other effects. While certain effects may not be prevented, they can be minimized to a certain degree. Below are some of the ways one can cope with the hangover chills and fevers. The fever, sweating, and alcohol hangover diarrhea that results from drinking can drain body fluids. Drinking lots of water during the hangover period can replenish the lost fluids. Drinks rich in electrolytes, sodium, and simple sugars such as fructose can also come in handy to sustain the body. There is no pill that claims to be a one-in-all hangover shakes cure. That said, one can manage the fever, body aches, throbbing, and chills through painkillers such as aspirin and antacids. The purpose of diet during a hangover is to replenish nutrient levels that are diminished. The following foods can play a key role in helping cope with fever and chills after drinking alcohol. Some of the common go-to foods include asparagus, tomato juice, sandwich, and ginger. In particular, ginger can also come in handy as one of the ways on how to stop yourself from throwing up after drinking. Resting lowers the level of bodily activities and slows down the metabolism process thus minimizing the amount of heat released. When feeling chilly, it means the body mechanism cannot adjust as fast to the external cold environment. Ensure one keeps warm at least for a short period to prevent hypothermia. Exercise should be avoided or minimized when experiencing hangover fever. This is important because exercise raises body heat and this can put a strain on the blood vessels thus spiraling the fever off control. Typically, fever and chills after drinking do not last for a long time following a drinking event. However, there are certain cases where one should seek medical help. Intensity of Symptoms Increases – Fever or cold chills after drinking alcohol can go beyond the expected intensities thus making one uncomfortable or having trouble sleeping. When it gets to the point where the body becomes sluggish or the heart races fast to the point of losing concentration, one should ensure they get in touch with a doctor. Prolonged Fevers and Chills – Hangovers should last for an hour or thereabouts. However, the body system may react differently leading to cases where the duration of chills and fevers goes beyond the ordinary. Chills that last for 3 hours or more or fevers that take one down a whole day should be checked by a medical practitioner. 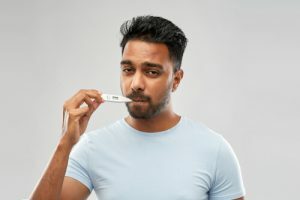 While hangovers are bound to happen the morning after, understanding the limits on how far fevers and hangover symptoms chills should go can help judgment on when to seek medical help. Always follow the instructions on how to cope with these hangover effects. In some cases, the doctors will prescribe the detoxification to remove alcohol from the body. This is the first step in treating addiction to alcohol.